I ran Recuva on a 12TB HDD that I accidentally formatted. After about 12 hours it notified me that it has found many files. I locked the user and left, but I think my computer went to sleep. Now the Recuva process appears to be stuck at 50%. Should I start over? I have not turned off my PC besides the standby mode yet. 12tb? Are you a commercial enterprise? A normal scan should not take too long to analyse, as it is reading the MFT only. 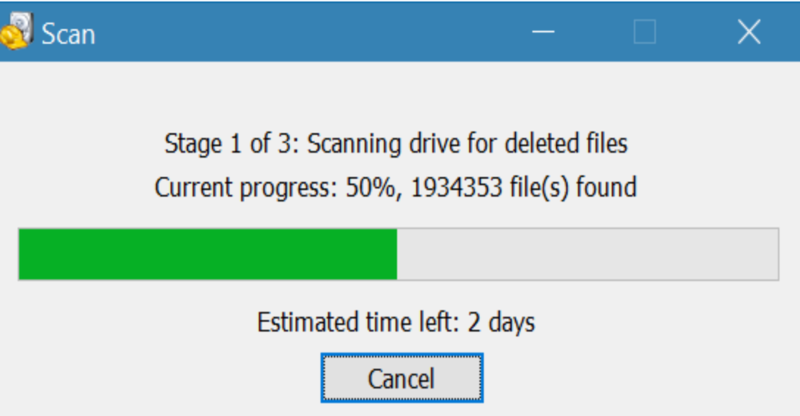 I don't know how many files there are on 12tb but even if there are a few million the scan should only take a few minutes (if it gets to stage 2 or 3 you can cancel the scan and still see the results without any apparent deleterious effect). If it's a deep scan then I guess it will take forever. Users with 2 or 2 tb disks complain that a deep scan takes days, so 12tb? If Recuva did finish, and found multiple millions of files, what human brain could sort that out? I doubt if I could. Well, it was just a 12tb that I stored my steam library and other games. Destiny 2 is 90gb... so it's easier than you think to fill up a 12TB with personal stuff like a 4tb movie library and family photos and videos in 4k. But yes I am pretty sure I picked deep scan. I knew it would take quite a while, but my main concern was if the standby/lock would impede my progress that I have run for about 2 days or should I start over? If it takes a week to complete I might as well restart unless I can determine that my progress has been maintained. No one knows whether it will stagger back into life or not, nor could we say whether a stop and start will have the same problem or not. It's up to you. However, if the disk has been formatted I would cancel the job, go into advanced mode, select Options/Actions, uncheck Deep Scan, Check Scan for Non-Deleted files, and run the scan again. Did you check Check Scan for Non-Deleted files? If you have nothing in the Filter/Path box then it must find something. I did have the non deletet files and it found 5. You should be finding at least 20 $ system files. Too late here to continue (and I'm out of ideas). This drive had no system installed on it. Just a separate storage drive. Thank you for your help tho. Much appreciated.